Essentially, a binary space partition algorithm will recursively divide a surface into two for a number of iterations. A binary tree provides the most obvious data structure to traverse the different levels of partitions. For partitioning, in each iteration the direction of the division -horizontal or vertical- is assigned randomly and so is the size of the first partition, while the second just takes the remaining of the space. 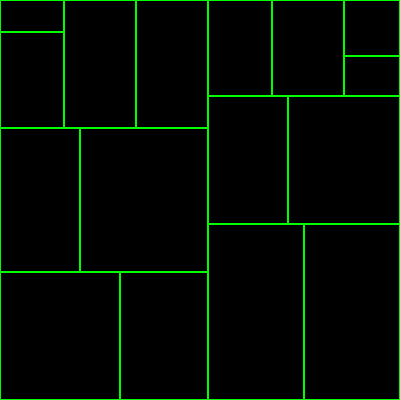 Later, on the leafs of the tree (down-most nodes), rooms can be grown within the container, be it randomly or by assigning some constraints that suit the generation. Finally, by connecting the center of each one of the partitions with his brother, all the partitions get connected and accessible. Maybe it’s a good idea to check the interactive demo of the code that comes ahead before starting. To increase the number of iterations make sure to increase the map size accordingly. Let’s get into it. First we need a toy implementation of a binary tree. Do not consider the following feature proof or efficient code-wise. That’s it. Well, we might sooner or later need some auxiliary functions to get an specific level of the tree and to get the down-most bottom leafs of it, be it for debugging or just for the exercise. This should be enough to keep things forward. 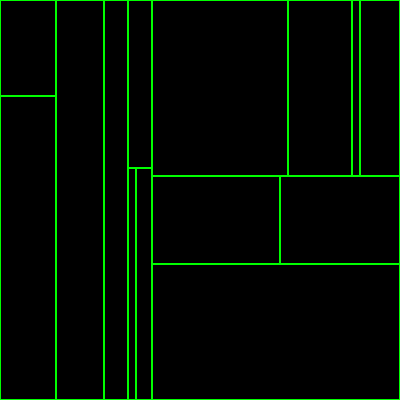 Again, an array mapped tree would avoid us some unnecessary recursive steps, but this is a demo, right? Okay, let’s build this tree. We need a function that grows a binary tree of containers. Good, now let’s throw it into a canvas! The wording here might look a bit weird, just assume we are entering this in a development console. Woosh, not much impressive, this barely resembles a Piet Mondrian scam. Randomness it’s all good and fun, until you find out that containers sized too small or too large will result in weird looking results, so here I am discarding any container with a horizontal or vertical ratio smaller than a predefined one. Too aggressive ratios will follow with growing the stack size out of the heap limit. I do not know if this is the best solution, or if I should not worry about too small partitions, or for instance if I could generate the random width or height with a minimum value (though, I do not like that, as it makes the algorithm code as straightforward. If we define a minimum of 3 squares, what happens when you are confronted by an hypothetical partition of 4 squares?). Much more pleasing to the eye. It’s true that a pattern-like structure can be seen and by discarding small results epic randomness is also being discarded, with the possibility to delete rooms that are too small or impossible (hence, resulting in one less room in the map). In any case, the option of discarding is left open, and the results wielded are much more intelligible just for this post. At the start I was looking after a city-like partition. 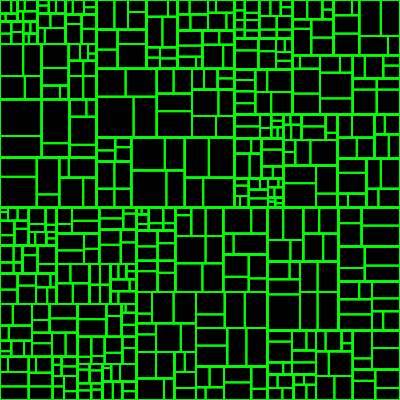 To see if BSP will yield me what I was looking after, I did set the recursion level to 9 with a map size of 500 squares. The results resemble what I want, and give me enough material to move to the next stage. For the purpose of my generator both rooms and paths are a bit out of the scope as it is not exactly what I am looking for yet. However, I will include them for the sake of completeness, so inaccuracies should be expected. As mentioned earlier in the post, when we are happy with a recursion level, rooms are placed within each container. The sizing on the room can be defined by any rules. 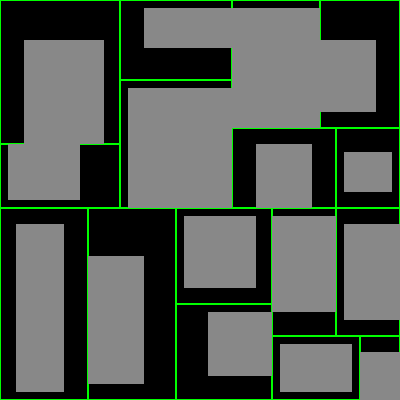 In this example, rooms are grown with a random padding ranging from 0 to a third of the room size (for each of the sides). By allowing it to be 0, the possibility of touching rooms is contemplated, which should give interesting results. Using the helper function to get the leafs of the tree rooms are created dependent of each one of them and later its paint function is called. Sweet. Now let’s add a way for paths to be drawn on the canvas. Again, the purpose of this demo is just on drawing the stuff, so we are not going to save them in any structure, nor carve it into a tile map. Let’s see what happens if we draw a line between the centers of containers with the same parent. Good as done. Now, what about some cleaning up? Feel free to check the playground demo at /demos/dungeon. Maybe is there a little problem in your …?